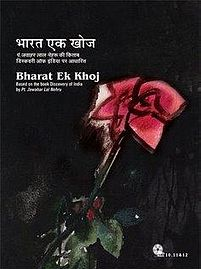 Episode #12 of Hindi TV Serial Bharat Ek Khoj (which was aired on DoorDarshan and now is available as a set of DVD for home viewing); explores the first segment of the tale of Ashoka. The grandson of Chandragupta Maurya, Ashoka is one of the three legendary rulers known who are considered as “the great rulers”. The modern India also have several emblems related to AShoka available as official symbols. For example the Ashok Chakra, the central wheel with 24 hands in the national flag of India is named after him! Same way the Lion Capital Of India, the national seal or symbol of India is also related to him. At the start of episode Pt. Nehru (the actor playing him of course, needless to say) clears that he have a strong habit of scolding the kings, and he don’t see there is anything to praise for most of them. Though, there were few exceptions like Ashok The Great (aka Ashoka or Asoka the Great), whom he admire a lot. Asoka fought a lot of battles, experience rivalry even in family, have some strange relationships but he is known more for something else. In the battle of Kalinga, he saw a lot of blood and have questioned himself about the righteousness of the battle. It eventually lead him to the path of solace of the soul and he followed the path guided by Gautam Buddha. This transformation of a brave, genuine and brutal king to a saintlike persona, is what Ashoka will be remembered forever. Om Puri plays Ashoka convincingly. K. K. Raina is in full form (it is tough to find him out of form almost anywhere). Most of the actors play really convincingly and it is a delight to watch the clash of quality acting on screen. The superb background music, the convincing locales, the focused camera angles make the stuff a delight to watch. The episode explores the first part of Ashok (aka Ashoka)’s life. The events covered includes exploration of Ashok’s superiority in administration. He was able to control the chaos and rebel which his elder brother and the successor of the King Bindusar (aka Bindusara) unable to. RadhaGupta was a minister in Bindusar’s court who was loyal to Ashok due to his abilities. Same way there is a minister named Vikram Bhatt who is loyal towards crown prince Sushima. The clash of thoughts between these ministers is explored really well. It shows the dirty politics were always there. Also the incidents of Mahabharat seems being repeated here too. Everyone have lust for the throne and power. It is much higher when people grow up in the environment of palace. Ashoka’s clear vision during the administration, his wise and thoughtful tactics to keep the source of money (the business council) of his area happy assured him the flow of money in the way he wanted. It also helped him creating his own army and make it ready for the battle for throne, which has to take place one day in the future! He made his alliance with the business council by supporting, then growing, Bauddha philosophy (the guidance by Gautam Buddha) and marriage with the daughter of business council head’s daughter! Both father-daughter were influential in Bauddha devotees. The episode also explores the vision of these father-daughter about Ashok’s claim (in future) for the throne, and then the place of themselves in King Ashok’s court. It reminds us the tale of Satyavati, her father, and king Shantanu of Hastinapur. Are the history is made to be repeated? A few soldiers who have comparatively smaller role acts below the expectation, rest of them are in full form. Also when you see Bindusar on the death bad, he have his hairs gone white, but his mustouche is pure black?! Is it forgotten to update? The scene where you see; the lust of power and authority shown by Bindusar when seeing that the things are not in his control, when he was on the death bed; is the high point of the episode, as it indirectly conveys the fact that it is tough to get rid of possession and material stuff, unless you detach yourself from it. You need to prepare yourself at the right time for that. That is the reason that there are four segments of the life (Brahmcharyashram, Gruhasthashram, Vanprasthashram and Sanyastashram) are defined and asked to be followed in Hindi mythology, very wisely. Again, this episode proves that with, good content, good dialogs, great performances; a nice stuff can be made even in the tight budget and technological limitations. You should not miss this episode for the content it possess.